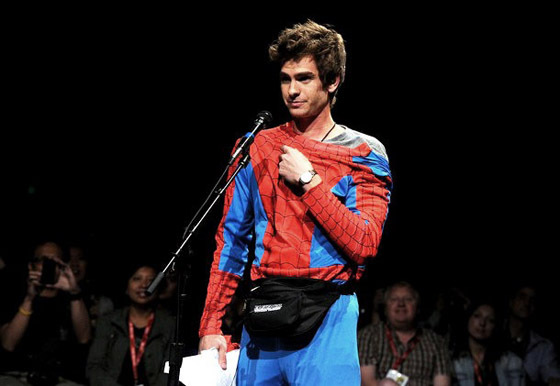 The ComicCon Panel for The Amazing Spider-Man was part of the Sony Pictures panel in Hall-H & kicked off with actor Andrew Garfield in a cheap 'Spider-Man' costume giving a passionate speech about how Spider-Man has inspired him and why he loves the character so much. The panel included director Marc Webb, Emma Stone producers Matt Tomack & Avi Arad, with Garfield joining them on stage. Hit the jump to check it out. Props to CBM for the footage. I'm reading: Watch The ComicCon Panel for 'THE AMAZING SPIDER-MAN' Incl ANDREW GARFIELD & EMMA STONETweet this!